Actually, Boğaziçi Restaurant hasn’t been around as long as lots of restaurants in Fethiye. We remember it being built when Phase 2 of the harbour was started. But, since then, it’s been a constant. A place of familiarity. And Boğaziçi Restaurant was actually the first restaurant we ever wrote about on the blog, back in 2010. Since that date, the article been begging us to start all over again with it. One (terrible) photo, not much information (hey, we were quite new to all this back then) and, as such, we’ve never really pointed people in the direction of said article. We’re putting that right now! We don’t think of Boğaziçi as one of those posh restaurants where you go for a special occasion. That’s not an insult to the place. It’s just our place where we like to park ourselves in the daytime with our shopping. If we’ve been into town or to the Tuesday market, it makes for a nice stop off for refreshments, especially on a hot day. It feels comfortable; like a cafe. You don’t feel like you’re sitting in a restaurant, disturbing the situation by just asking for a drink rather than a full meal. The two main waiters have been there for as long as we can remember and that adds to the familiarity. A quick smile and a greeting as drinks are brought out without us having to say what we want. They know what we want. The owner used to have a lokanta in the town centre for many years. Just about everyone in Fethiye knows him. Again, always a familiar greeting and a smile even if we’re just walking by. But don’t get us wrong, here. Boğaziçi is a fully-fledged restaurant. You can get anything from light snacks to main meals of Chateaubriand and various seafood. If you go at weekends from late morning to early afternoon, you’re going to be lucky to get a table, especially if you want to sit by the sea. Weekends are when Turkish families descend on Fethiye harbour to enjoy a very leisurely Turkish breakfast. And Boğaziçi Restaurant is famous for its breakfast. So much is the choice and so busy is the restaurant, the breakfast is laid out as a buffet where you can just keep helping yourself to whatever takes your fancy. Eat as much or as little as you like. On weekdays, your breakfast will be served to your table. Your table will still be rammed with multiple plates and pans of foodie treats. But weekends are where you can pick and choose. You might remember we had a bit of a phase, recently, where we decided to return to some old favourites and try out some new places, too. We had a tasty meal at Paşa Kebap. And we went to Kayaköy for the first time in quite a while and hiked over to Cold Water Bay. A walk we hadn’t done in over 10 years! Boğaziçi Restaurant accidentally fell into that category. We decided to go out for lunch – a quick snack lunch. Somehow, we ended up at Boğaziçi, gazing into the fridges and choosing meze dishes! Time to remind ourselves that Boğaziçi is a restaurant and not just a comfortable refreshment stop. Oh, and the idea of a light snack was out of the window. At places like Boğaziçi Restaurant, we never look at the menu. It’s always straight inside to see what’s on offer today in the display fridges. Having run a lokanta for so long, the owner knows his way around Turkish food. 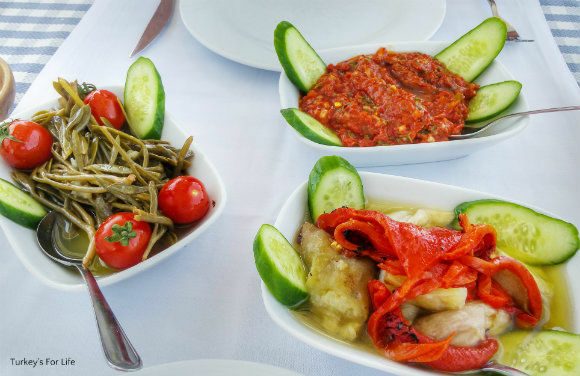 We skip the international dishes – if quality Turkish dishes are on offer, why eat something else? We remembered from a snack, many moons ago, that the Boğaziçi Restaurant Antep Ezmesi was pretty fiery (as it should be) so we chose that. Barry spotted the rock samphire (kaya koruğu); the more meaty version of marsh samphire (deniz börülcesi). It’s a bit of a fashion these days to have it in the meze fridges which is a great bonus when you love the stuff! And then we went for a roasted aubergine salad. Usually, the aubergine and red pepper are roughly chopped but, as you can see in the photo, this was a chunky salad. All served with a basket filled with crusty cobs straight from the oven. We made short work of the meze dishes. The Antep Ezmesi was indeed as fiery as we remembered. Lemon, olive oil and garlic marinated the rock samphire. Olive oil was the dressing for the roasted aubergine salad. We vowed to have just one crusty cob each – well, we’d gone the whole hog and ordered kebabs, too. I ended up having two. Can’t resist freshly baked bread! As usual, by the time the main meals arrived, we were wondering if we had any room left inside us to tackle them. I ordered the tavuk şiş. Again, the kebabs are all on display in the fridges so you can see what looks good on that day. The chunks of chicken were marinated in spices and it looked really tempting on the skewer. That was my lunch. And what looked tasty in the fridge, on the skewer, was very tasty when it was served up, barbecued, on my plate. Classic Turkish rice pilaf accompanied the chicken along with caramelised onion, charred green pepper and tomato. Shredded raw onion topped with zingy sumac and chopped lettuce gave the fresh crisp texture. Charred on the outside but juicy and tender on the inside, the chicken was delicious wrapped in the lavaş bread. And we’re nothing if not creatures of habit. We didn’t know this at the time but after re-reading our original article about Boğaziçi Restaurant from 2010, guess what main meals we ordered back then! Guess the chicken şiş and the Adana Kebab must always look tempting in the display fridge! So, our return to dining at Böğaziçi Restaurant was a big success for us. We prefer bulgur pilaf with grilled kebabs over rice but that’s just a personal preference thing. The whole meal was really tasty and everything was as it should have been. Another Fethiye restaurant back on our foodie radar. Boğaziçi Restaurant is the first restaurant on Phase 2 of Fethiye harbour as you walk from town. It’s a great place to watch the sunset. Prices are reasonable and both Turkish and international dishes are served. Choosing from the fridges is a great way to dine at Boğaziçi but there is a snack menu and full menu available, too. You can find Boğaziçi Restaurant on Facebook and Instagram where you can see photos of some of their other dishes. You can also find Böğaziçi Restaurant, and many other eateries around the Fethiye area on our page dedicated to eateries and watering holes. Lovely spot for a good meal and a couple of Efes. Cheers!